Day 2 went great even though I didn't sleep enough but that's my goal for tonight. So far it's been good, not headaches yet just a little bit tired but mainly because of the lack of sleep, I hope that changes soon. I had a busy day but I managed to eat 3 meals + small postworkout meal. I had cravings of something sweet and crunchy after dinner even though I was satisfied and not hungry and I only drank some water and got busy doing stuff to keep that craving off my mind, this time it worked! Meal 1: pastured eggs, sauteed asparagus, olives, fermented sauerkraut and black coffee. Meal 3: Spicy beef stew, delicata squash mash, sauteed asparagus & home brewed blueberry kombucha. 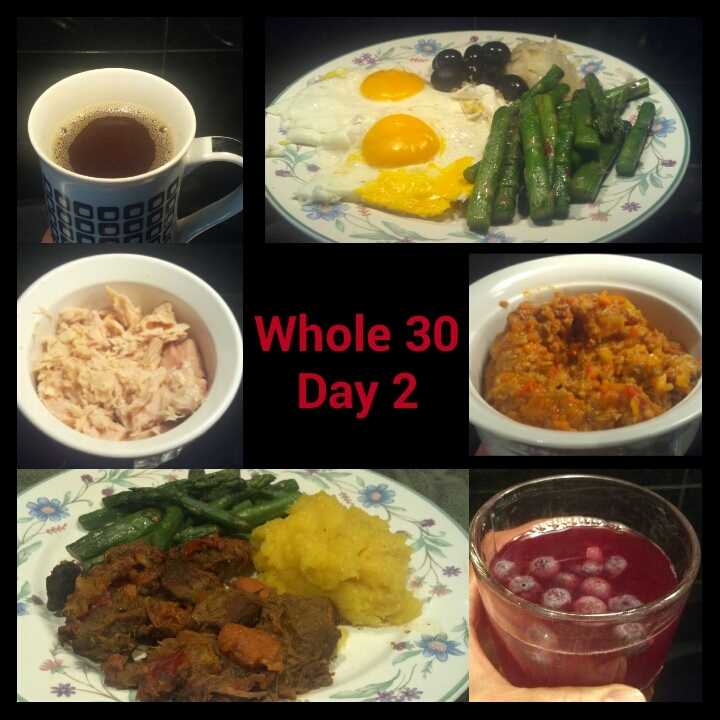 I started my 2nd Whole30 on October 1st, as well. Hopefully, I won't backslide after a few months go by this time!! My first Whole3 started on September 2 but on day 29 I found that the Red Wine Vinegar I was using wasn't compliant, it had bisufites in it so I started again on October 1st. This time I am logging everything I eat. I want to try to pinpoint what might be causing my fibromyalgia to flare and see it there is any correlation with food and migraines that I am not aware of. The first week or two can be really hard but stick with it. Prepare as much as you can and don't be afraid to eat the fat you need each meal. Although I didn't start on Oct 1st, I'm going to join the thread as I'm starting this weekend Saturday Oct 5th. It will be my second time doing it as I did it back in Feb/March and loved it! After my 1st Whole30 I was sticking to a Paleo diet, until I was struck by the bad news that my dad had terminal brain cancer on April 1st. My mom was diagnoses with kidney cancer Nov 2012 and this news pushed me into my once again bad habit of emotional eating. Since then I've been too wrapped up in the busy things in my life, I got married in July, moved across country from Salt Lake to Cleveland, and started a new job to be closer to family. I'm done making excuses when it comes to my bad eating habits. If I'm asking my parents to be health and quit smoking and drinking, then I need to take care of myself also. Looking forward to sharing this experience with everyone. PreWO should be a small portion of protein and some fat. Save your carbs for afterwards - post WO should be a meal sized portion of lean protein and starchy vegie carbs! True!! I have been looking at my eating the last 3 days and there are things that need improvement! more fresh veggies and greens and fewer cooked starchy veggies. I was thinking about what to make for the next week or so, and a few things that I would normally have, I'll have to make without eggs. Last night's salmon patties kinda fell apart, but still edible. Chopped liver should be fine without eggs, too. I am going to make avocado dip for the raw veggies next time. I cant stand mayonnaise, cant have hummous or salsa(AIP), so avocado dip will encourage me to eat more veggies. Day 3 is cruising along....time to take a walk, its too nice out to waste indoors. Thankfully no headaches or cravings, but didnt sleep great last night. Still, did NOT HAVE coffee today!! Had a cup of iced oolong tea at M2 (did I mention its WARM today?). Well, off to walk to the library. Hi everyone! I started on October 1st as well. Day 3 and I'm doing okay. The hardest part for me was giving up Diet Coke. I have been addicted to the stuff for about 25 years...I drank that more than anything else. I can handle the caffeine withdrawal, but it is the psychological addiction that is killing me. Everything just tastes better with Diet Coke. I'm hoping that by the end of the 30 days I will laugh at that statement. I do miss my carbs as well...breakfast is the hardest meal for me, as it was always a bagel or toast or a muffin. I've already been learning a lot about nutrition and I bought things at the store that I never in a million years thought I would see in my cart. (coconut aminos? sunbutter? CRAZY!). I've never been on this type of diet before, so it is a completely new experience for me. I know I can do this. It's nice to be able to connect with other people going through the same thing though! BM, you shouldn't be that hungry! Can you perhaps post your couple of days worth of food/activity for us to have a look at? I started Monday 30 September, and am in Australia, so I'm just at the end of day 5 now. I've loved it so far! Fresh, wholesome, filling foods, and I've been quite satisfied between meals. I have noticed that my fat consumption seems quite high (I was entering everything in My Fitness Pal for the first week just to get a handle on how much I was actually eating, portion sizes, macro breakdown, etc), but I guess so long as I'm following the 'finger' amount of fat in each meal it doesn't matter? Had a little bit of a headache on day 3-4, and have been a little tired this afternoon (day 5) but other than that, all good. Going to spend the weekend getting organised for next week; I think organisation is key for me at the moment while I get my head around the meals and guidelines! I'm glad you've stopped logging - what are you basing your comment about high fat on? It's partly why you aren't supposed to log your food - the program isn't based on macros or calories. Stick to the template and you'll be fine give your body what it needs - if it's hungry, feed it! Here's a timeline of what most people experience on their journey - it might be handy to know what's coming up! Thanks Amberino! I had previously followed a 35:35:30 plan of protein:carb:fat and the breakdown of my first few days of W30 were more like 30:25:45 which surprised me? Guess it doesn't really matter provided I follow the guidelines and am satisfied. I am super impressed that I don't get hungry between meals, since I was previously the sort of person who got 'hangry' mid-morning and mid-afternoon and HAD to eat something. This afternoon (day 6) is the first time I'm a bit hungry, so had a few cashews and a kiwifruit and I'll be good until dinner - going OUT tonight for the first time on W30, so excited to put my new paleo skills to the test! Ok, no, I didn't fall. It was a choice. Jumped off them moving wagon. Now I have a migraine to show for my stupid ness. I was having a very difficult first week. Nothing seemed to be going right! Every day was a battle, and I was usually only succeeding at two proper template meals per day. So finally yesterday, caught in a thunderstorm with no lunch... I ate from a (decent) salad bar. But I could tell the chicken had some kind of coating on it that was surely uncompliant. And then the sweet potatoes... clearly coated in maple sugar or something. So I did end up saying EFF IT an ALSO got chocolate covered almonds frm S'bucks. Amazingly I'm not that depressed about it. Hopefully this is a clue that I really can do this lifetime because I will (hopefully) just get better and better at avoiding total truck stop offroading. I'm learning what triggers me and what helps me resist. I know that once I go 'off' I tend to take advantage of it and do lots of little off roading - a sip of someones diet coke, a bit of my daughters white potatoes....so right now this is a mental battle of epic proportions. I feel terrible today physically, which helps gettng right back on the horse... .I'm not waiting for another 'magical day 1'. So moral of the story is - when it all goes to hell in a handbasket...beating yourself up does nothing but keep you in hell longer. I have done one w30 so I KNOW I'm not somehow lacking a discipline chromosome. If there is one thing I continue to rant about, it's the fact that it feels IMPOSSIBLE to be compliant away from home. I find this hugely problematic. Once I'm really good at this, the fact that the healthy salad has seed oils or whatever won't bug me as much. But right now the fact that I am DOOOMED if I leave the house without food with me is a huge bummer. You can do it lexes42! Sometimes are harder than others....just get back on the wagon. Today my sugar dragon called me - and I have had 2 bananas and 2 figs and raisins...sigh. I dont usually eat bananas, and now I am craving them. Oh, well, at least I did alot of walking and gardening today. On the plus side, I havent been craving chocolate. That's huge. And I dont miss eggs. But I miss nuts. Day 8 down, Day 9 will be better. Yay, the forum is up and working again!! Well, day 8 is over and finally I can say that since yesterday I am feeling amazing! Good bye headaches, lethargy and bad mood! I seriously feel really well and thankfully I haven't had cravings and that is a big plus for me. Now that I think about it, yes, I craved salad all day today and sometimes I don't like eating much of it because it takes a lot of it to make me feel satisfied and I don't think the effect lasts as long as steamed veggies with ghee, even though I add avocado and other fats to the salad I feel hungry after a couple hours later. Meal 1: leftover stew beef, steamed broccoli with ghee and a cup of black coffee. Meal 2: Fried eggs using coconut oil, fermented sauerkraut and a huge salad of greens mix, peppers, avocado, apple, blueberries and balsamic vinegar. Meal 3: grass fed spicy meatballs with homemade marinara sauce, steamed broccoli with ghee, delicata mash and a small salad of greens mix, peppers, avocado and balsamic vinegar. I have noticed the importance of taking my time to sit down and eat, when I sit down and relax I get to enjoy the food and I feel satisfied sooner than when I am in a hurry. I must confess that a lot of times I eat as fast as possible, standing while getting ready and doing something else, yes, I am the Queen of multitasking! I need to better organize my day so I don't feel rushed during meal time, that is something I need to keep working at. See you soon, let's stay together, let's stay strong! We can do this. This is me. I've had a few crazy days, and while the food was all ready and compliant (thank you, meal plan! ), I ate in such a rush and without the kind of mindfulness I'm striving for. It's especially hard that the babyâ€”toddler now, reallyâ€”wants to climb on me and share my meal when I sit down to eat. At least she's eating good food, too, I guess! I don't know if it's my hurried eating or a few not-so-balanced snacks here and there, but I've been feeling queasy for the past couple days. I'm going to try to sloooow down and see if that helps. Bad: My cal/mag/D3 pills have SOY in them!? What the heck!!! Does that make my first 9 days invalid (I didnt take them today)??? Good: other than soy, I feel like this is going well, and I can continue as long as I need. Woo. Glad the board is back and glad to be hearing from people however infrequently! I am on day 11. Yesterday was amazing, I had boundless energy and felt great. Today is another story. I am hungry, tired, and well.. grumpy because of the previous 2! It's been both hard and easy so far! Sometimes it's easy, other time it's not. Going to a Bday party for a good friend on Fri and and sounds like they are dead set on trying to get me to break my diet. It will be Cuban food (which I love!) and they are already putting pressure on me to drink. Sounds like a new test! Hope I do well, my hope it to just sip sparkling water with lime. I am starting to feel more confident with my food selections, and not freaking out every time "Are Dry Roasted Pistachios Ok? is this ok". I am realizing that even if I accidentally eat something it's not the same thing and still it's very different from things I would normally have had! So at least there's that. On the negative side I am getting really bored of eating same type of things! I made a soup last weekend and finished it yesterday, it was a pretty easy dinner and I could eat it while cooking up other stuff to eat with it so I had food when I got home instead of the cooking. Snack (because I eat lunch so early because I'm a teacher and don't get to pick my lunch time) Cut up veggies - carrots, bell peppers, and some olives (in sea salt) and a scoop of what was left of my egg salad from breakfast. I'm not hungry. I'm drinking tons of water. I'm just afraid that I might not be doing this right because I don't "feel" anything... am I supposed to? It seems like I am. It's a fight not to weigh myself every single day, but my pants are a little looser already. Anyway here in Australia, and having started on 30 Sept, I'm on day 12, and doing well. We had a warm day a few days ago and I walked past the fridge in the afternoon thinking "ohhh a diet coke would be so good right now" but kept walking. Definitely need to explore options for cold drinks on warm days - I love water and drink litres of it every day, but something different would be nice occasionally. I've felt like my tummy is slimmer (all bloating gone) although day 10 and 11 it wasn't as slim as day 8. Hoping this is just the changes to digestive enzymes as the timeline suggests. All my injuries/inflammation is the same though - no magic there yet, but I live in hope! Last night I had pork tenderloins and made my own unsweetened applesauce to go with it, and I was looking at it thinking: "Oh I could put this in a ramekin dish with some coconut flakes, almond meal, walnuts and coconut oil and it would be like an apple crumble. And as much as I know that that's not allowed (eat an apple instead!!) the thought has planted itself firmly in my head. Hello! I hope everyone is making good progress on their W30. This is round number two for me, so I have already adjusted to the way of eating. Everything is going well, I am not hungry in between meals, and my three meals a day are usually pretty varied and I'm ready to eat them when they're in front of me. I have been doing a lot of weight training and pretty substantial cardio as well. I am beginning to see good changes in my body, a loss of fat and an increase in muscle mass. I believe this way of eating is doable for me for life. For the first time ever I am not struggling on an eating plan. This round has not been very difficult for me. I am not craving snacks, I am not craving sugar, and I feel as though my body is getting exactly what it needs. I have not weighed myself since the end of round one, but my clothing fits much looser and I am able to fit things that did not fit me a couple of months ago. All in all, this has been a very successful week or so for me. I hope everyone else is doing great and focusing on the positive results that they would like to see. I started mine on October 4! Although for the first 7 days, I was drinking one glass of milk each day (didn't want to toss it!) so in a way today is my day 1- first day without any prohibited foods. Because of that, I'm thinking of extending my Whole30 an extra 7 days so I'm truly doing 30 days with no cheats. Oh, the food dreams! The insane FOOD DREAMS! About things I never even ate pre-Whole30! What the what? Day before yesterday, I indulged my cravings for "a little something sweet" with extra fruit. I don't know how many servings of fruit I ended up eating, but it was more than the meal template recommends for sure. And I felt TERRIBLE. The more fruit I ate to try to satisfy my sweet tooth, the more I wanted! For what it's worth, I ate almost no refined sugar before, but lots of fruit. Yesterday and today, I experimented with eating no fruit. Not in the "you can never have this again" way; in the "let's see what happens" way. I feel much better and more satisfied with my meals. I have a Fruit Dragon. I had a dream last night that I ate pretzels! The big sourdough kind that break your teeth! when I woke up I felt guilty for going off my W30... and then I realized that it was just a dream... wow! I never thought I would use that cliche line, ever! proud to say that i did not indeed detour and that I am going strong... feeling great... and noticing a little extra room in my pants... today will be a tough one because I'm taking my son to the movies and popcorn is my ultimate cyrptonite! I thought about making some toasted coconut but I'm all out and don't have time to get some, make some and make it to the movie... so i'll bring a bag of veggies, olives, and some chicken to keep me on track. i thought my body would go into complete withdrawal from all the breads, starches and sugars but it really hasn't... is that odd? is something wrong with me? Day 12 and I keep expecting to feel something magical...but not feeling much different. I do notice that my moods have been slightly more stable, and I'm less irritable. That's a definite plus. And my chronic constipation has gone away. In case you're interested, lol. I haven't gone off plan yet but I have found that I'm eating a lot more fruit/dried fruit/Larabars/nuts than I should. And I'm snacking a little too much I think. I have always been a big snacker so cutting out snacks is hard for me. And I know I've always been a sugar addict so I should really be trying to limit sweet things. I cut out Diet Coke (been a HUGE addict for years) so I have been letting myself have one Izze natural soda a day, which I know isn't great...but I have found it almost necessary to keep my sanity. I'm going away for a 4 day weekend next Thursday and I must admit...I'm terrified. Vacations always derail me! I'm determined...but I know I need to plan, plan, plan.